You know you’re passionate about what you do when you go from new home sales agent to new home owner. Meet Mike Pereyra, a Brookfield Residential sales agent who took his love for the product to the next level. 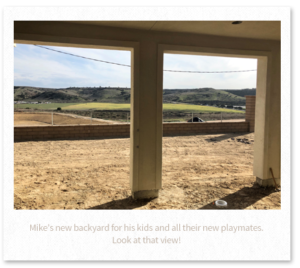 We chatted with Mike about his journey as a proud first-time buyer at The Village of Escaya. First, let’s get to know Mike. As mentioned, he’s a Brookfield Residential sales agent, born and raised in Bonita, a city neighboring Chula Vista. He has three young kids, ages six, four, and two (we’re sensing a pattern here, Mike) and a wife who has an awesome work-from-home career. “But when we move into our new home, I’ll be just up the street from work, so I’ll pretty much have a work-from-home situation too!” Talk about daily commute goals. For Mike, the choice to make The Village of Escaya his family’s new home was an easy one. His top three reasons? The location, the people, and the school district. “I like being close to the freeway, while also not being too far inland. And my wife’s parents are just one exit away.” Besides being a prime grandparent-visiting locale, Mike liked that Escaya is made up of a younger crowd and a tight-knit community, “The place we’re moving from has a lot of people who are retired. But Escaya mostly has people our age, which means more playmates for the kids, and more friends as neighbors.” On top of that, the kiddos will have access to a network of high-performing schools, and a new K-6 in the heart of the community, coming soon. Now that you’ve heard Mike’s story, ready to start your own? Explore the full range of options available at The Village of Escaya by clicking here.